The European Commission warned today (23 June) Romania not to lower VAT from 24 to 19%, as the government has proposed. The Romanian parliament is expected to pass the bill tomorrow. Asked about the proposed measure, Commission spokesperson Anika Breidthardt said that this new unilaterally proposed VAT rate raised “substantive questions” and could have “a negative effect on the sustainability of Romania’s fiscal situation”. Romania’s parliament will approve sweeping tax cuts on Wednesday, leftist Prime Minister Victor Ponta said late on Sunday, amid international concern that the move could push the country’s budget deficit to unsustainable levels next year. Ponta has rolled out proposals for tax cuts that would be effective next year through 2019, including a sharp reduction in value-added tax from the current 24%, saying they would help fight tax evasion and spur economic growth. “On Wednesday, the ruling coalition … will vote to adopt the tax cuts with one change, lowering value-added tax to 19 percent instead of the initial cut to 20 percent,” Ponta said on his Facebook account. The International Monetary Fund and the European Commission have warned about the fiscal impact of the cuts, which include the scrapping of dividend and special building levies, lowering of excise duties and the reduction of the VAT. Romania has a €4-billion precautionary aid deal with the IMF and European Commission that ends in September. The country’s fiscal watchdog also has questioned the proposals, which are currently being considered by the country’s parliament. Ponta has said a final vote should be expected before the end of June. Ponta’s government has taken several measures to loosen fiscal policy this year, including cutting the VAT for food to 9%, raising the minimum wage and doubling state subsidies for children. The government has said it can afford the measures because of unexpectedly higher revenue. Its consolidated budget ran a surplus of 0.85% of gross domestic product in the first four months of 2015, while public investment was near zero. Meanwhile, anti-corruption prosecutors are investigating Ponta on allegations of forgery and money laundering related to his work as a lawyer. Parliament has blocked prosecutors’ attempt to investigate Ponta on charges of conflict of interest as prime minister. 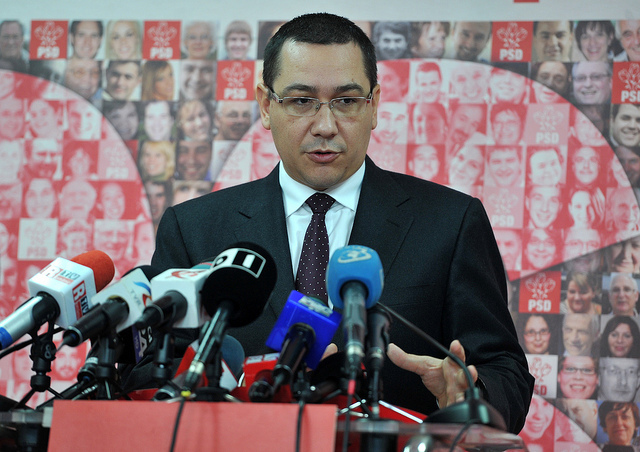 Ponta has rejected calls for his resignation. On Sunday, he said he would be unable to perform his duties for the next 28 days as he recovered from knee surgery in Turkey earlier this month, and asked President Klaus Johannis to appoint deputy Prime Minister Gabriel Oprea as interim premier until Ponta can return to duty. Iohannis signed the decree appointing Oprea the next day. How did we get to a situation where the EU dictates tax rates to member states? It’s time someone stuck to their guns & told the EU & it’s unelected dictators to do one. Tax is a government issue at National Level.